Welcome to the second year of GURPSDay, and this is the first GURPSDay post of 2017. Let’s make this a great year. How? Two action items: post more, recruit more. It’s really that simple. Below you can find the blog activity from the last seven days. 47 so far as we start the year with our list of 73 blogs. Sundered Lands 19 (1/05/17) – Seeker and Silver swim for their lives and find who they are looking for. The group then has to figure out another way back to the surface. The newest adventures in the Sundered Lands of Palladium, our GURPS: Palladium Fantasy campaign. Grand Duchy 94 (1/05/17) – The Grey Company discusses how to appropriately deal with a spider’s nest. Summary of the latest play session of The Grand Duchy of Adventure, our GURPS: Mystara campaign. Discworld Roleplaying Game Review (1/05/17) – The Discworld Roleplaying Game, powered by GURPS, promises adventures inspired by one of the great storytellers of the last century. Discworld fans and GURPS players alike have lots of appreciate in this work from Pratchett and Phil Masters. Balancing GURPS Combat: Odds to Hit (1/03/17) – One of the keys to being a confident GURPS GM is to understand how to create combat encounters that are balanced to the party’s abilities. This post will look at a critical element of combat balance: how likely each side is to land blows. Dramatis Personae: Monica Harmann, Street Speedster (1/05/17) – An ordinary college student at NYU with no distinguishing features… except she can run as fast as a car. Equipment Locker: Prismatic Muskets (1/02/17) – An expansion to my previous post on redpowder, with more detailed equipment, rules and options. Session: Ras’ku-ten (1/05/17) – Assault on the spell-less lich’s sanctum. Campaign Social Contract (1/01/17) – Filling out Pseudonym’s fundamentals. Streamlined Spell Casting (1/05/17) – A very simple and freeform magic system for powerful spell casters with unpredictable results! Recap: Silly Romperoo, Season 1 Episode 8 (1/05/17) – Respite and detours. Recap: Silly Romperoo, Season 1 Episode 7 (1/03/17) – A slow, high tension battle is finally over. Recap: Silly Romperoo, Season 1 Episode 6 (12/31/16) – Fighting slimes really slowly. Recap: Silly Romperoo, Season 1 Episode 5 (12/30/16) – Party in a dark stinky pit versus Infravision Archers. Next Next post: He’s got missile lock! 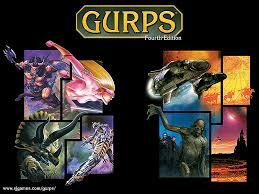 Do you have a published list of all 73 GURPS blogs somewhere? I don’t, but I can fix that real quick. It’s a good idea.